It's another big CEO payday on Wall Street. 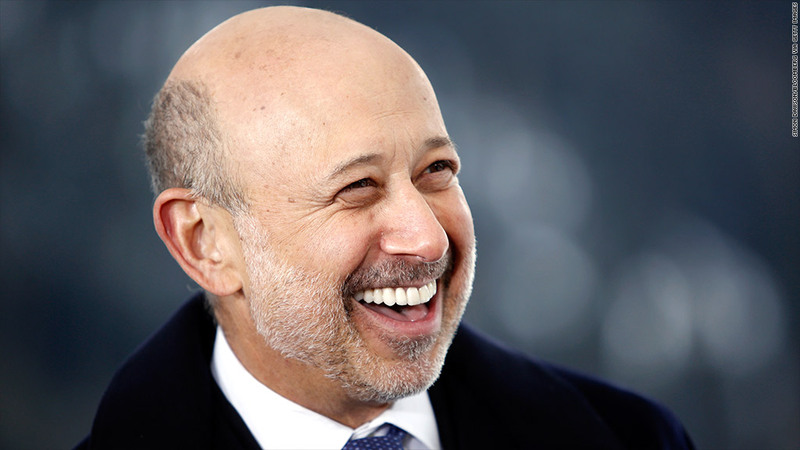 Goldman Sachs says CEO Lloyd Blankfein will receive shares in the firm currently worth $14.7 million, and that will be only part of his pay package. The disclosure, which was made late Thursday, showed that Blankfein will receive 88,422 shares, spread over the next three years. That is up 43% from the number of shares he was granted a year earlier. Goldman (GS) stock gained 39% in 2013, although it is off about 6% so far this year. The company has yet to disclose his base salary or cash bonus for last year. In 2012, his base pay was $2 million, and his cash bonus came to $5.7 million. Assuming those aren't cut, his total package will top the $21 million he got in 2012. But that is still well off the staggering sums he and other Goldman executives were getting before the financial crisis in 2008. For example, in 2007, Blankfein's compensation came in at just under $54 million, according to Goldman's most recent estimate. That made him one of three officers of the firm receiving more than $40 million that year. Blankfein is actually likely to see less of a raise this year than some of his Wall Street counterparts. JPMorgan Chase (JPM) CEO Jamie Dimon received a 74% pay hike, despite the bank's big legal payouts last year. Dimon's stock award was $18.5 million, up 85% from the previous year.